I made a sample of this design to check size and color. The size is ok, but I would change the color so the aircraft is a more natural bomber color of silver and gray. I had a great deal of color difficulties, but your company helped make it perfect. Thank you, beautiful embroidery. I love this type of design. This is the first design I have seen with the flag. Very detailed. Am putting this on a lap robe for a DAV in the VA Hospital in Lake City, FL. This design is beautiful and stitched out perfectly. The only issue I had was the color transfer to my machine, but that was an easy fix on my end! Very happy with this design. Wonderful design. Well done! Thank you very much. The stitching on the body of the plane could have more satin stitching. The fabric showed through. I changed some of the colors and embroidered this on a Men's polo shirt for a benefit on Veterans day to help our Veterans. It stitched out great and looked fantastic. The others (4) also (in other designs) looked great. 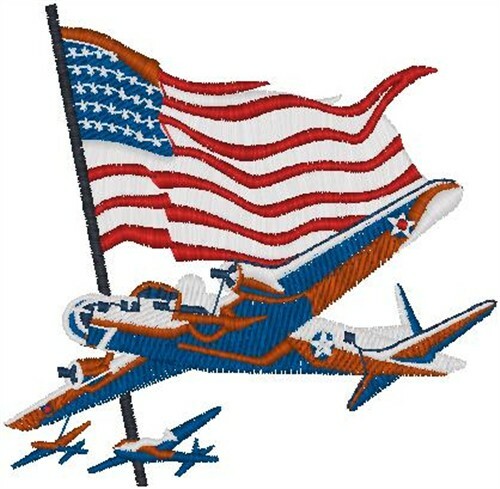 Heavenly Designs is happy to present American Bomber machine embroidery design which has 11747 stitches and is [109.00 mm x 106.00 mm] large. If you would like to view more embroidery patterns please search on our embroidery designs page.